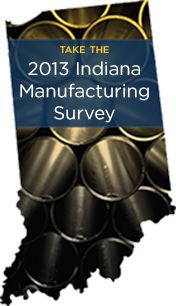 Katz, Sapper & Miller, LLP, is pleased to announce our seventh annual survey assessing the state of Indiana’s manufacturing and distribution industries is now underway. The Indiana Manufacturing Survey is conducted in partnership with the Indiana Manufacturers Association, Conexus Indiana, and Indiana University’s Kelley School of Business. The survey remains open until May 31. Indiana manufacturers and distributors interested in participating are encouraged to do so by visiting the Indiana Manufacturing Survey site. Upon completion of the survey, respondents will have the opportunity to request a copy of the final results, which will be released in mid-2013.